Hmm I've never talked about my hubby, have I? Well, he doesn't like to be talked about he he he. He is a person seldom seen in photos...because he's always the one taking them. A tripod and automatic capture is only used on several important occasions like Christmas, Birthdays ..etc...at those times he would race to stand beside us before the blitz flashes. This of course produces things like askew ties, windswept hair and sometimes images of him still running towards the well posed group...which makes it a more endearing photo he he he. 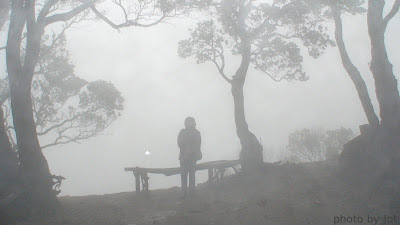 Last vacation the whole family went to Tangkuban Perahu Mountain which has several craters. Since family outings are rare, this was a good time to bring the camera for capturing family history !! Well when we got there [a three hour trip from our city] it was soo cold at the top near the crater, that we almost couldn't get out of the car. Chub was shivering and his lips were beginning to turn blue...maybe also brought about by the shock of seeing thick and dense fog that descended around us as our car climbed up the mountain. Chub has never seen fog !! he kept asking us if we should just turn back, coz he couldn't see anything anyway....ha ha. 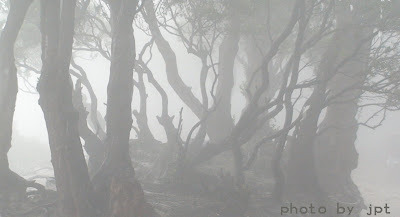 Since the fog was very thick and lovely and mysterious, I begged my hubby to take some pics. By that time it was raining also, we had stopped hiking and had taken shelter in a small bamboo kiosk which sold hot tea and coffee, hot pisang goreng and hot noodles...Well ! Melchan and Chub felt at home at once and wouldn't come out of there for a long time. So...you can only see me posing in these pictures...the kids refused to budge from their spot behind the bamboo tables... they were busy eating hot noodles, pisang goreng [fried banana] and sipping hot tea. Dear Hubby, I found the pictures, they were in the guest account. Thank you for taking them. They are great !!!! Don't be mad at me for mentioning you in my blog. Love you, my oce. PS. 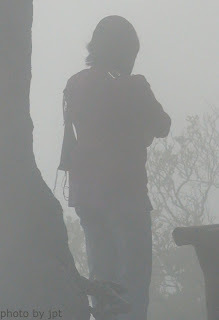 The craters are behind where I stand, they can't be seen because of the fog and rain..I actually got very wet from standing there in the fog and rain for a few minutes and had to order hot noodles and hot tea same as the kids. Thanks I'll tell him...or he will probably read it there in Timor Island. 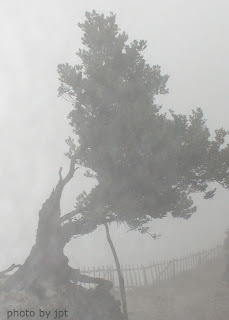 When I first saw it I felt like you too..you know,it was a bit scary cos of the fog...and people disappeared suddenly [there were many before] to take cover from the rain. Go there next vacation Cyang...pisang gorengnya besar2, harganya mahal, karena tidak ada saingan ! 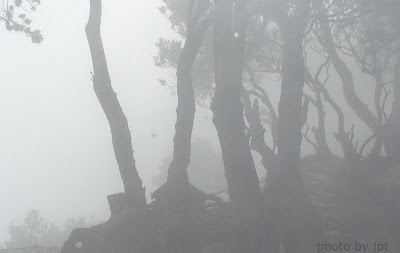 OH do you remember The Legend of Tangkuban Perahu, with Dayang Sumbi and Sangkuriang?? Myoce I think that's the whole point of the setting and your husband captured it. It envoked a certain feeling / emotion and that what makes a very good photo. The picture of the tree and you are perfetc! and we'd like to go there too later. I agree with you Hyds ! If I were to go there again maybe I should wear a long flowing dress and do my hair up to complete the illusion ? ha ha ha....see you !